Amazon may be one of the biggest and most influential companies in the world, but a tense situation that is currently unfolding at its headquarters may serve to send the tech giant into free fall: A trembling security guard isn’t sure whether to shoot Jeff Bezos or the Alexa claiming to be Jeff Bezos. Woof. It doesn’t look like this is going to end well. After hearing something while patrolling Amazon’s deserted headquarters after-hours last night, a rookie security guard reportedly pulled out his gun and demanded to know who was there. Jeff Bezos stepped into the light and identified himself, but just a moment later, an Amazon Alexa on a nearby desk also identified itself as Jeff Bezos, and claimed the other was an imposter. The security guard, who had just been hired a few days earlier, immediately asked both Jeff Bezos and the Alexa for identification, at which point Bezos said he was the CEO of Amazon. Following his lead, the Amazon Alexa then said the same thing. Though Bezos was initially able to convince the guard not to shoot because he looked and sounded like billionaire Jeff Bezos, the young man then pointed his gun toward the Amazon Alexa, who immediately began to defend itself. 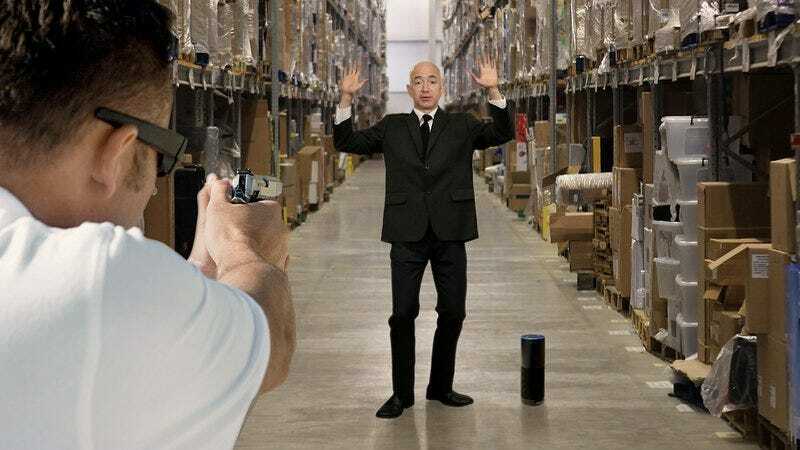 The cloud-based, female-voiced machine subsequently claimed that the man beside it was merely a bald man in a black shirt pretending to be Bezos, and that it was in fact the real Jeff Bezos, prompting the now-flustered guard to once again point his gun in the other direction. According to sources, this back-and-forth repeated several times with the shaking security guard struggling to keep the gun steady in his sweaty hands. The sound of a man yelling, “Shoot him, I’m Jeff Bezos!” followed by the sound of a robotic woman saying, “No, shoot him, I’m Jeff Bezos,” could apparently be heard echoing throughout the empty office over the young guard’s nervous, shallow breaths. Nearly half an hour of arguing later, the flustered officer reportedly threatened to just go ahead and shoot them both if no one told him who the real Jeff Bezos was. After the guard demanded they both say something that only the real Jeff Bezos would know, Bezos told the employee about a special safe in his office, and the Alexa proceeded to recite the text of the Wikipedia page for Jeff Bezos. Well, this doesn’t seem like it’s going to end well for Amazon or Jeff Bezos. Let’s just hope that when this is all over, the guard hasn’t hurt anyone, including himself, because according to the latest reports, he has put the gun to his own temple over the stress of the decision he is trying to make.